Blondie and Brownie: The Red Cup is Back! 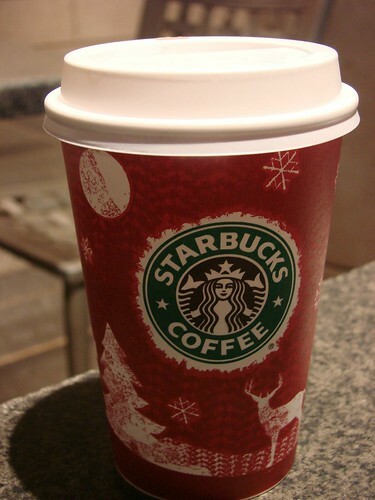 I've been watching to see how many days after Halloween until the Starbucks Red Cup appeared. For those of you at home keeping score, this year it was four; when I went to get my free Election Day coffee on Tuesday, I also got my first Red Cup of the season. I'm not sure I'm ready for "the season" yet. I'm not even sure what I'm serving for Thanksgiving. As for this year's Red Cup...meh. Is the faint pattern supposed to be Christmas trees? Or the stockinette stitch from one of grandma's Christmas sweaters? Not sure. It kind of looks like tire tracks to me. Personally I'm partial to the Pass the Cheer Red Cup Campaign from a last year with the jolly bright java jackets. Bring back the jolly java jackets! What do you think? Yay or nay to the Red Cup? I was super excited about the red cups too! I think they're so much more pleasant to look at than the white/green cups. I'm glad I'm not the only one!!! The red cup has not hit Winnipeg yet, but I go everyday to check. They just make me so happy. forget the cup...when the GINGERBREAD BISCOTTI shows up in the store - i do my happy dance & shell out $20 to stock up for the season! Love the new "gold card" that they sent me for free so i save 10% on each purchase.